PCS Move While Your Spouse is Deployed? No Problem! Over the years, I’ve been extremely fortunate to have my active duty spouse at home for every move we’ve made around the country. However, in today’s ever changing world, the process of a PCS on my own could easily happen. My husband could send me an email from his desk at work with a copy of our orders. But that desk and his work could actually be way out yonder at his deployed location. While chatting with fellow military spouses, I asked Sharon Gran, co-owner of MilitaryByOwner, and Jen McDonald,Content Editor and Writer for MBO, for their take on doing a PCS solo. Here are 15 suggestions. 1. Throughout the whole PCS process, you’ll most likely need Power Of Attorney (POA) documents. “When shipping your vehicle, getting medical records, and all the other out-processing tasks, make sure you have general or special powers of attorney for all the paperwork,” states McDonald. Of course, the hope is that the active duty spouse may be able to assist from their end. However, simply having the proper POA documents may ease the paperwork process. 2. With orders in hand, make an appointment with the government office that handles relocation at your current military installation. When setting up an appointment with that busy office, kindly ask them what documents you need to bring along. For example, you may need to bring a copy of your marriage certificate and/or the birth certificates of your children (dependents). Also, you may be asked to update your contact information. Ensure that the office has accurate email addresses and phone numbers to contact you throughout your move. 3. Another appointment you may want to consider making is over at the Finance Office at your current installation. Even if you've completed a PCS in the past, the benefits and allowances may have changed. "The more you know" the better prepared you may feel. 4. If you happen to be renting or living in military housing, notify your landlord or housing office of the timing of your pending move. Also, find out further details of what is required prior to move out. The less surprises, the better! 5. Take a gander at MilitaryByOwner’s PCS ebooks, resource articles and blog posts to help ease any stress while planning for your military move. Also, consider listing your property or hunting for your next home on MilitaryByOwner.com. 6. The ever growing “to do” list may seem a bit overwhelming. 7. If the pending PCS is to an overseas location, you may want to get a good start on the paperwork needed for a passport. As those ever-friendly folks at the post office say, "the earlier the better." The process to obtain a passport can take months, so think of submitting your paperwork in a timely manner. 8. With your passport in hand, consider storing it with other important "hand-carry" items in the "do not pack" corner of your home. Or, perhaps place these valuable items directly in the vehicle you’ll travel in. You’ll want to prevent these essential documents from being packed up, adrift in the sea of brown cardboard boxes. 10. In an effort to stay organized and find important information quickly, it may be helpful to set up a computer spreadsheet. Use this designated place to track the names and numbers you collect. For example, when discontinuing service at your current home, a handy spreadsheet could have the names, numbers, and account details of the utility companies. Also, when setting up service for your new location, it may be helpful to build a spreadsheet with utility contact information and account details. 11. Especially if you have young children, make plans for fun! Schedule an hour a day for something as simple as a walk through a park or climbing around at a restaurant play place. 12. Keep in mind, the packing and moving crew may set a hectic pace as they dart in and out of your house. To ease the stress around your casa, it may be helpful to “set up babysitters or play dates for pack out day,” Gran suggests. Also, if you have companion animals, you may think about scheduling pet daycare or boarding. 13. Please know, you are never alone in this! Don’t be afraid to ask for help. Perhaps a loyal friend can come to your aid while you have the movers packing and loading. Imagine a helping hand when you may need it most? Free to make a food run? Willing to re-stock the Gatorade cooler? Able to keep tabs on the moving crew? Yes! Total game-changer in your favor! 14. While packing up the family truckster with children and/or pets in tow, consider traveling to your new destination with an extended family member or friend. The company of another adult that knows you and loves you may offer a sense of calm amidst the storm. Plus, when you arrive at your new destination, another set of trustworthy eyes may ease the stress of the game of “moving box Bingo”--that oh-so-fun game we all play when goods are rapidly unloading off the truck. Beyond just assistance with the children or pets, a helping hand may be valuable for unpacking the kitchen and bedrooms. Organizing those two areas of the home may help you feel settled faster! Through it all, try to focus on the light at the end of the tunnel. Picturing the celebration vibe with the finale of the deployment may give a sense of strength through any stress. I have to say, welcoming my spouse back to an entirely different home would be a heartwarming payoff! Want more PCS tips? 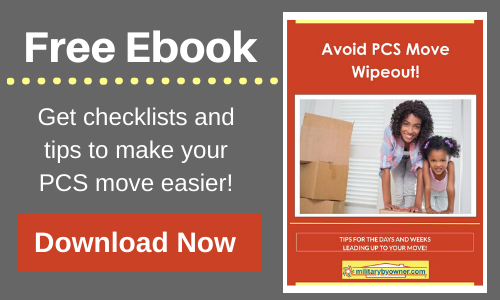 Download Avoid PCS Move Wipeout ebook below and check out the rest of MBO's series of PCS ebooks!